Ricco Barrino probably doesn't like being prefaced as "Fantasia's brother," especially since he's the oldest sibling. But she's the famous one, though big bro Ricco may be on his way to stardom. The High Point native has been grinding in the music biz for as long as Fantasia, but he didn't have the benefits of American Idol thrusting him into the limelight like his sister, however he did audition for the show last year. Ricco, or Puerto Ricc as he's also known, has had a couple of songs bubbling on the underground, including "Bubblegum," which is his 2007 collaboration with Fabo of D4L. And now that Ricco has connected with more artists in Atlanta--he splits his time between Charlotte and the ATL--he just may have his first hit. 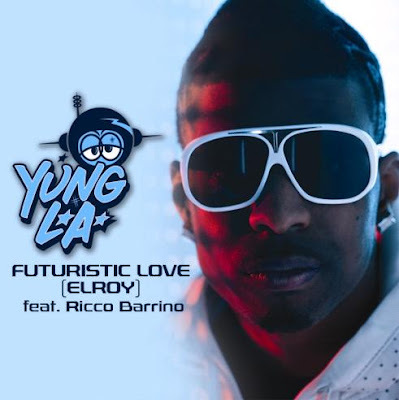 Atlanta rapper Yung LA, who burst onto the national scene last year with his hit "Ain't I," has recruited Ricco for his new single, "Futuristic Love." Ricco sings the hook and the quite catchy song is getting a lot of radio spins, particularly here on Power 98. He's said to now be signed to Grand Hustle, T.I. 's record label that is also the home to Yung LA and Young Dro, Fantasia's boyfriend. See, family ties can help. On the song, I think Ricco sounds like a male version of Fantasia. You can listen to "Futuristic Love" below. Well good for him. He should get himself together.